Isn't he just gorgeous? 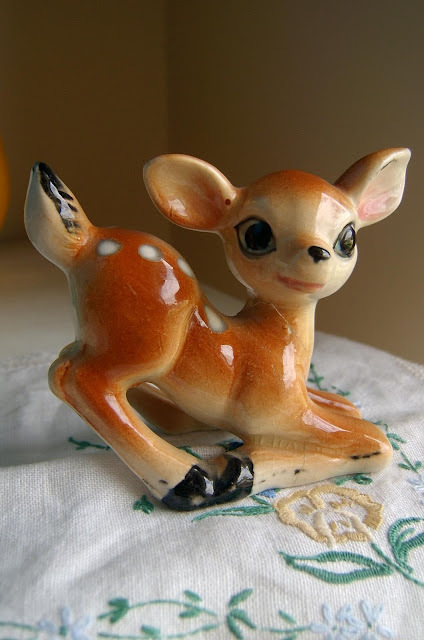 I found this little deer in a cabinet in a pokey little op-shop in Maldon. I have had my eye out for deer ornaments like this for a while now & this little one was my first find - all mine for only $2! His head has been broken & reattached with glue, but he's still perfect to me. It was love at first sight. Go and visit Sophie & see what treasures she & others have found this week. SOO sweet! The first of many I imagine. he is perfect! a broken neck just adds character. just gorgeous. What a cutie!! I would have scooped him up too! oh wow..i collect bambi & i would've snaffled him up for sure, perfectly CUTE!! What a handsome and cute little deer. I just love him. Thanks for sharing! Very cute - nice find! So cute, can never resist a porcelain deer, but this one is extra cute! Nice find! Very nice find. I was also going to say tie some ribbon around the neck and good as new! I have one sweet deer like his given to me on my 30th birthday last year. And have never found another like it. Yours is a sweetie!